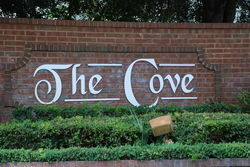 The Cove is a well-kept gated community with approximately 130 homes located off Old Lake Mary Road between Lake Mary Boulevard and SR 46 in Lake Mary Florida. It was originally developed by Ryland Homes in the late 90s into the early 2000s. Some of the homes are on Crystal Lake. The main campus of Seminole State College is very close by on Lake Mary Boulevard. Various restaurants and shopping are nearby on Lake Mary Boulevard and SR 17-92. For an easy commute, access to both 417 Expressway and to SR 17-92 are excellent. I-4 access is close by as well via 417 or SR 46 or Lake Mary Boulevard.